Description: It’s the coolest. The latest. The greatest. And it’s tall. 29 feet tall! And Extremely Fun rents it to you for a thrilling celebration! The 29’ Purple Spring Run ‘N Splash Combo delivers a ride that’s adrenaline-pumping, heart-stopping and breath-taking. It’s perfect for schools, churches and summer camps as well as your backyard—if you can accommodate its massive dimensions!%u202F Teens, adults and daring youngsters alike will LOVE the rush they get as they plummet down through the tunnel and into the refreshing pool that awaits them at the bottom. 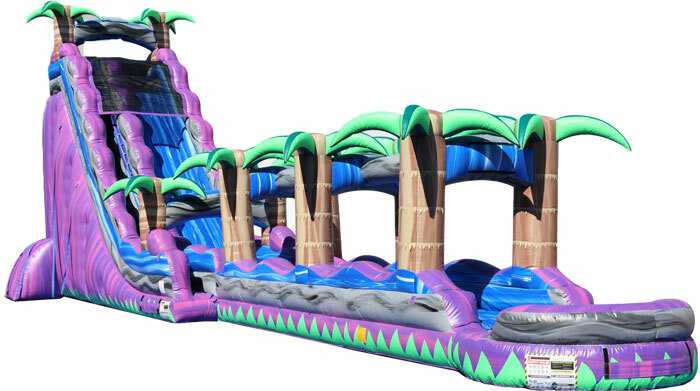 How big can you get your splash with this water slide party rental?